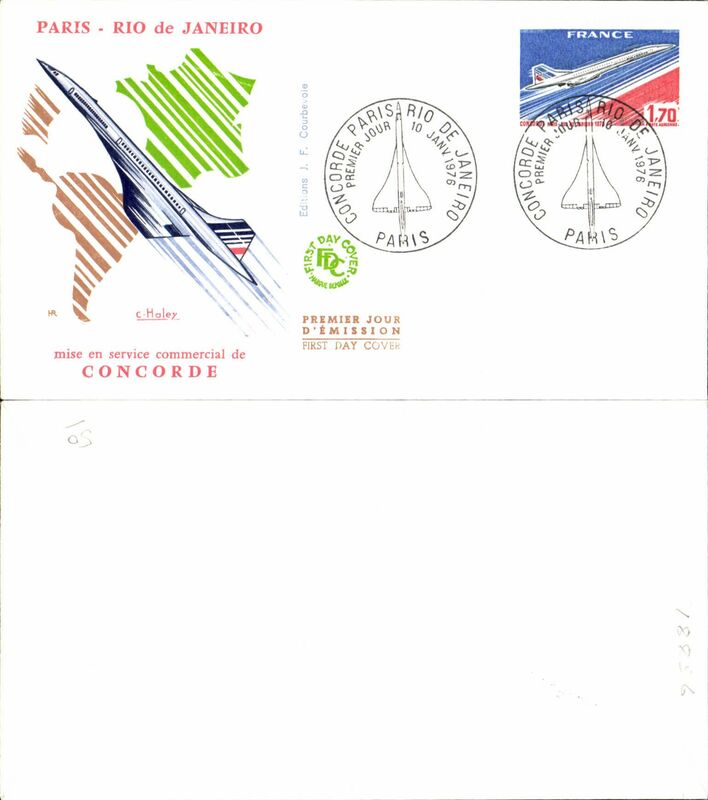 France souvenir FDC franked 1969 Concorde's First Flight, 1.00F. 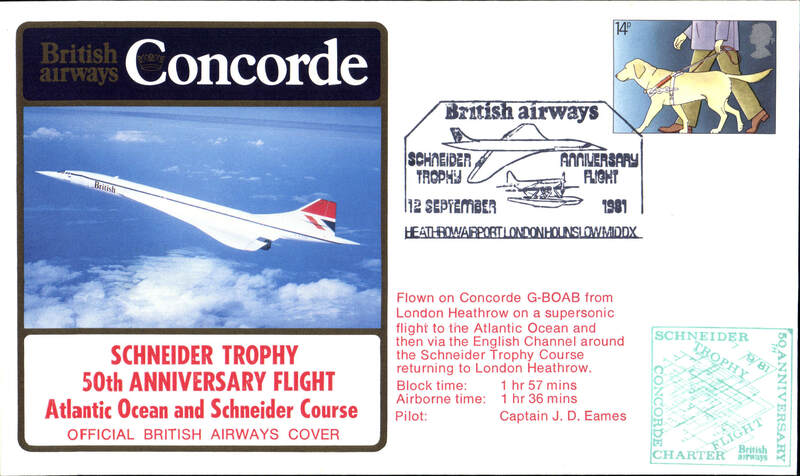 Concorde 002 F/F at Mach 2, at Fairford, Gloucester, illustrated souvenir cover, franked QEII 9d canc special black boxed commemorative cachet. Concorde 202, Tehran Mehrabad to Bahrain, bs. 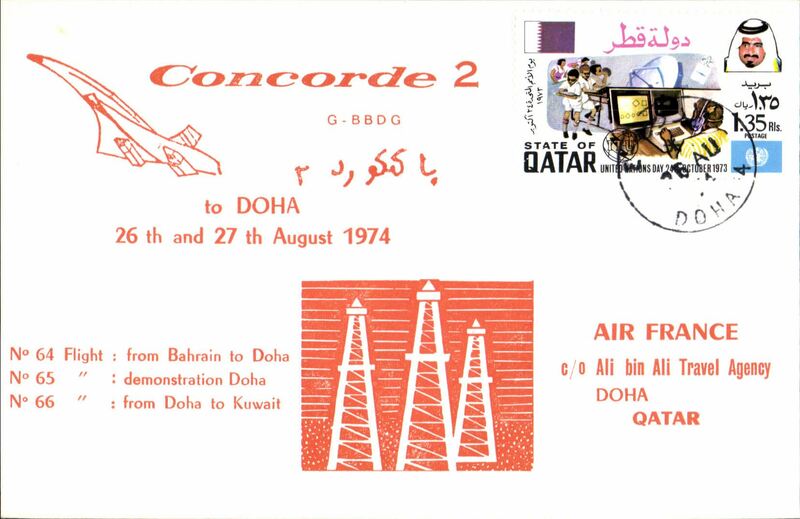 Qatar, Concorde 2 Doha demonstration flight. 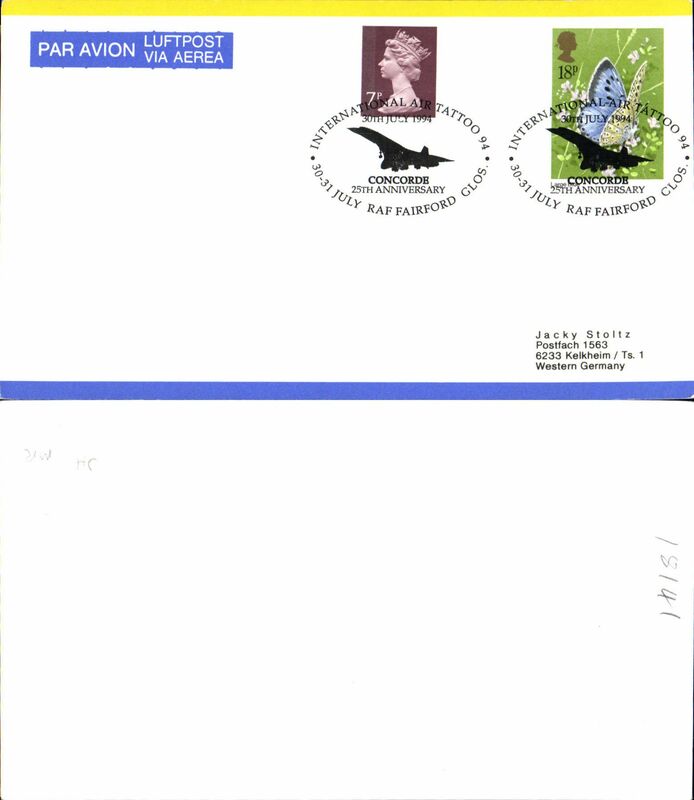 franked 1.35Rls canc Doha cds, souvenir cover. 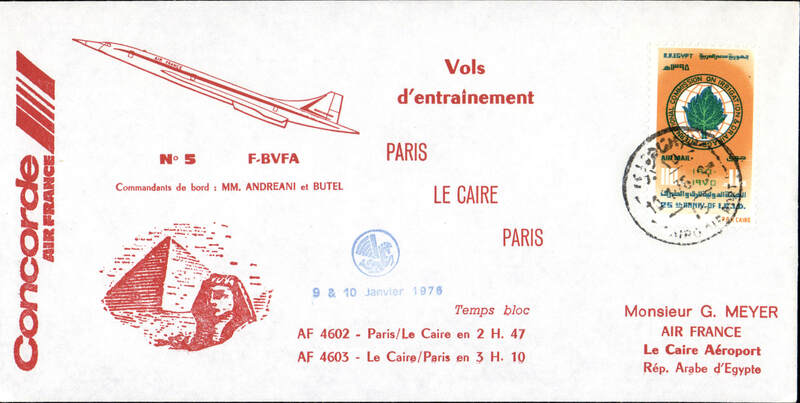 Concorde Air France, Pars to Cairo, and return. 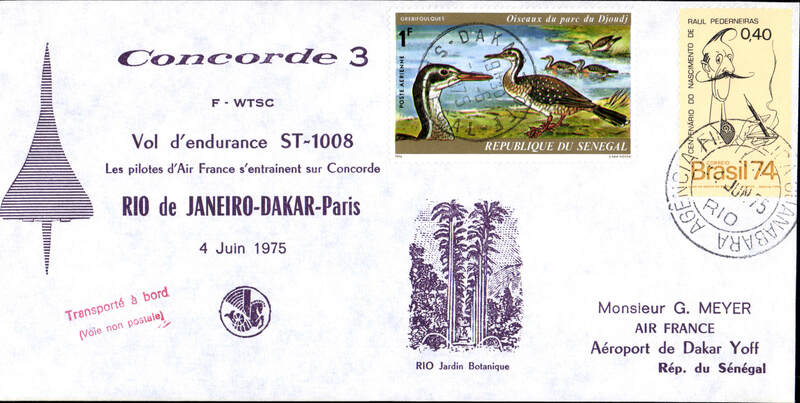 Concorde 3, 202, Rio de Janiro to Dakar. 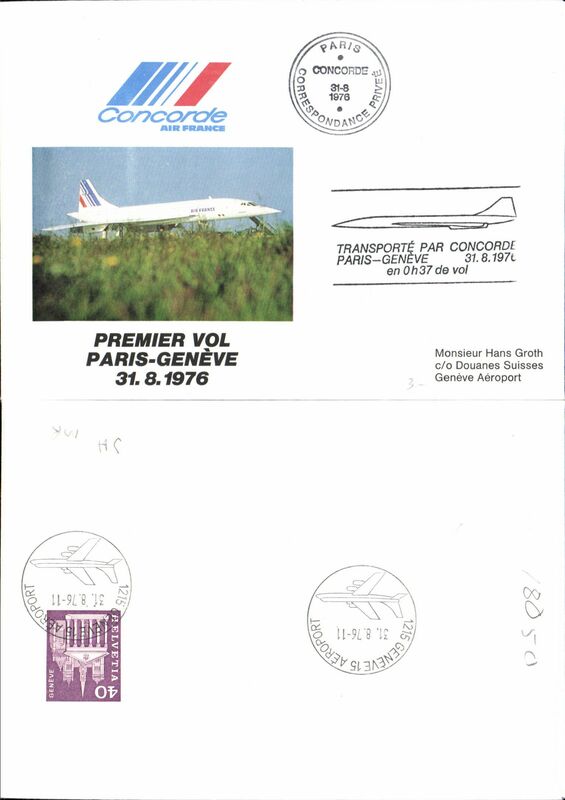 Air France Concorde Polar Endurance Flight, Touluse-Bodi-Touluse, souvenir cover franked 60o Norwegian stamp. 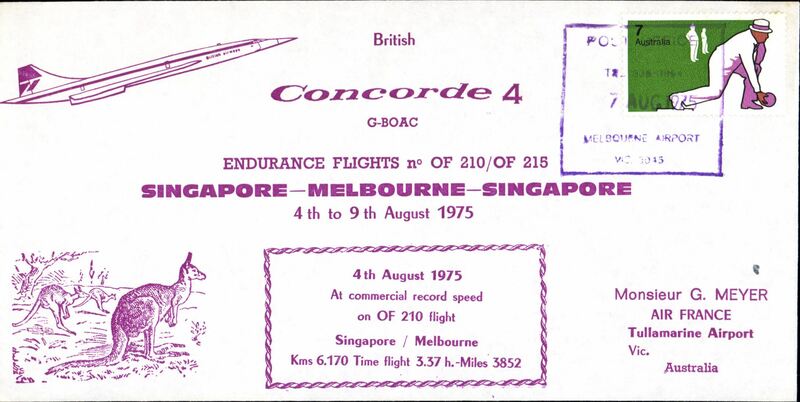 Concorde 4, Singapore to Melbourne Endurance. 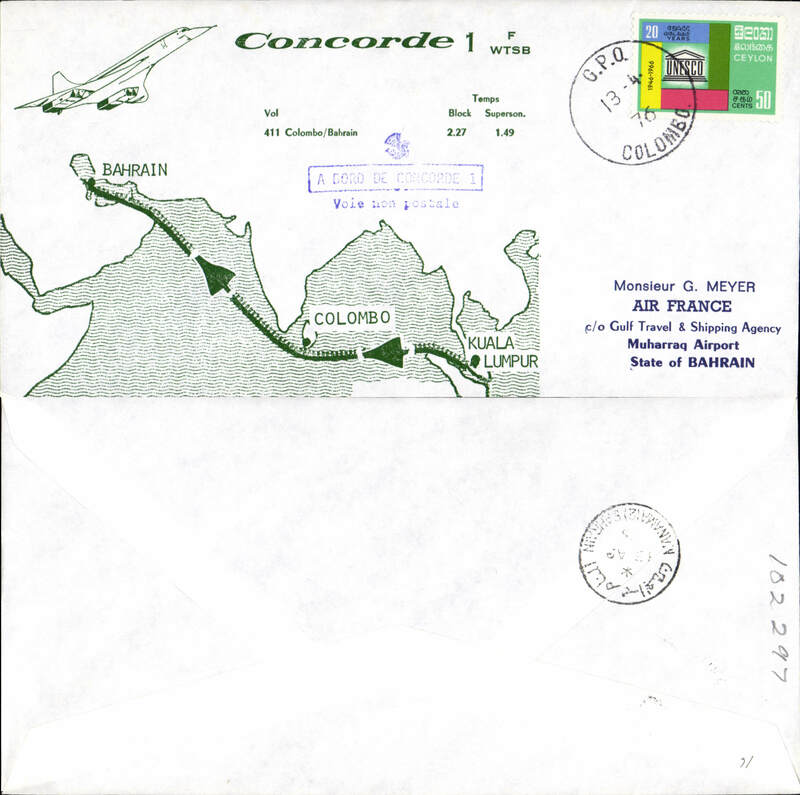 F/F Concorde, London to Bahrain, bs 21/6, illustrated souvenir cover franked GB 11p, special 'London Heathrow Airport/21 Jan 1976' Concorde postmark, circular green flight cachet. 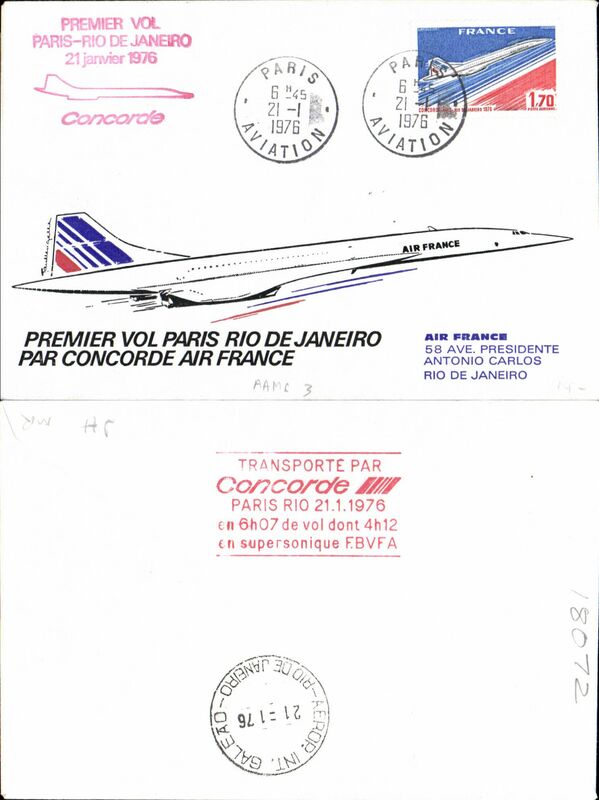 F/F Concorde, Paris to Rio de Janeiro, bs 21/6, illustrated souvenir cover franked France 1.70F Concorde, postmarked 'Paris Aviation 21-1-76' cds, red four line flight cachet. 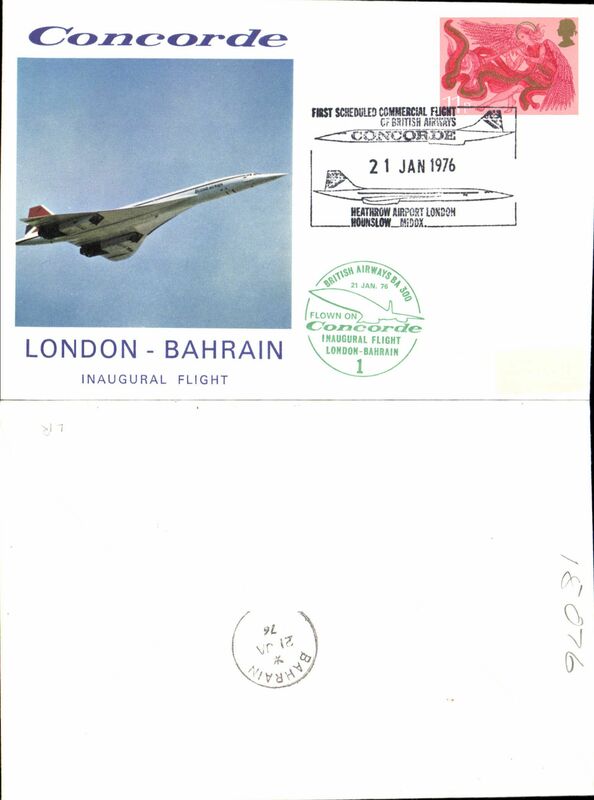 F/F Bahrain to London, official souvenir cover, cachet, b/s. 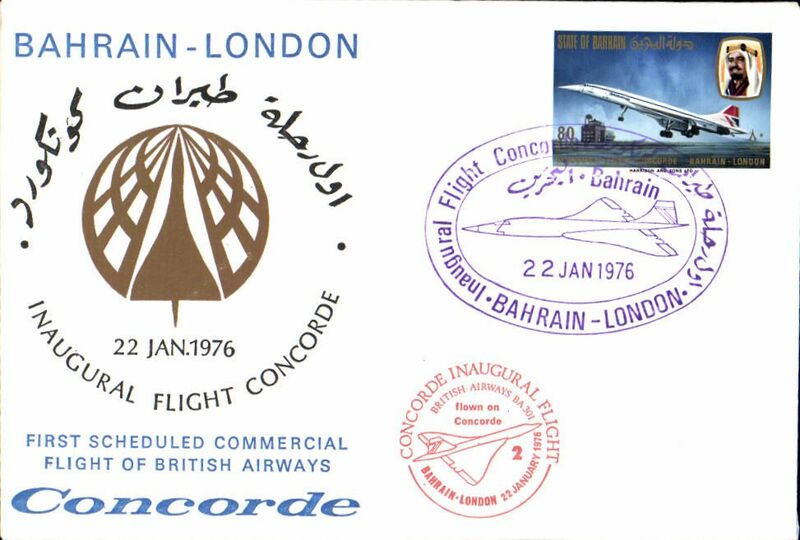 Inaugural flight Bahrain to London, official illustrated cover inscribed in English and Arabic, large purple special pmk and red circ cachet. 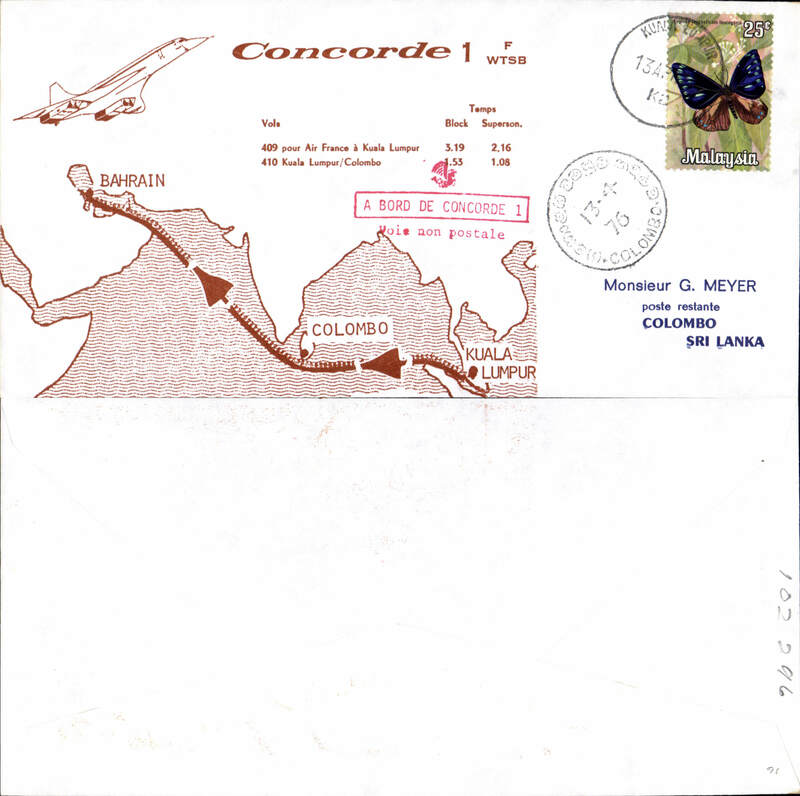 Air France Concorde 1, Kuala Lumpur-Colombo, souvenir cover. 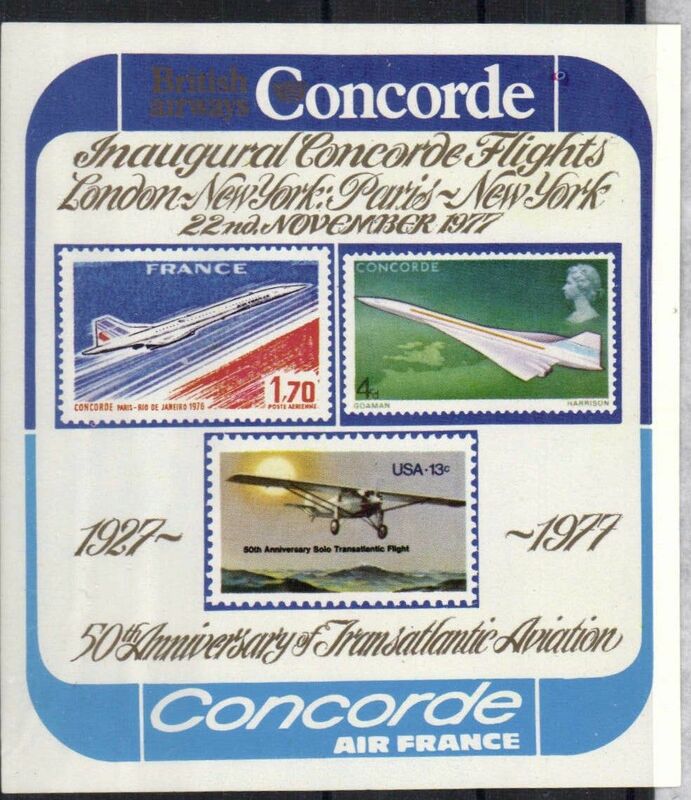 Air France Concorde 1, Colombo-Bahrain, souvenir cover. Isle of Man acceptance for carriage on the inaugural transatlantic flight London to Washington, bs 24/5, illustrated souvenir cover franked Isle of Man 13p, canc Isle of Man 22 MY 76 cds, blue framed 'Douglas, Isle of Man-London' and blue framed 'London-Washington' flight cachets. Belfast acceptance for carriage on the inaugural transatlantic flight London to Washington, bs 24/5, illustrated souvenir cover franked 11p, canc special Belfast 20 May 1976 departure postmark, violet framed 'Belfast-London' and blue framed 'London-Washington' flight cachets. Guernsey acceptance for carriage on the inaugural transatlantic flight London to Washington, bs 24/5, illustrated souvenir cover franked Guernsey 11p, canc Guernsey 22 MY 76 cds, green framed 'Guernsey-London' and blue framed 'London-Washington' flight cachets. Jersey acceptance for carriage on the inaugural transatlantic flight London to Washington, bs 24/5, illustrated souvenir cover franked Jersey 11p, canc Jersey 23 MY 76 cds, violet framed 'Jersey-London' and blue framed 'London-Washington' flight cachets. 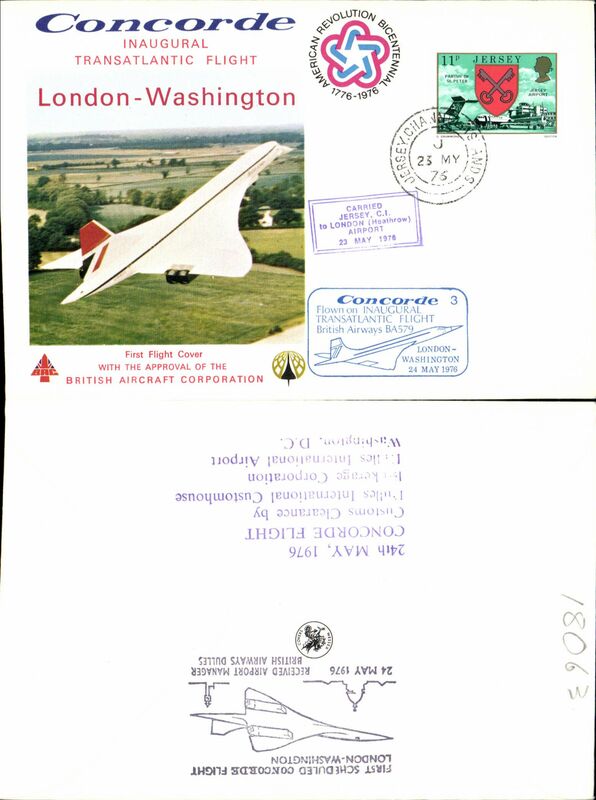 F/F inaugural Concorde transatlantic flight London to Washington, bs 24/5, illustrated souvenir cover franked GB 12p, canc special 'London to Washington' postmark, blue framed 'London-Washington' flight cachet. 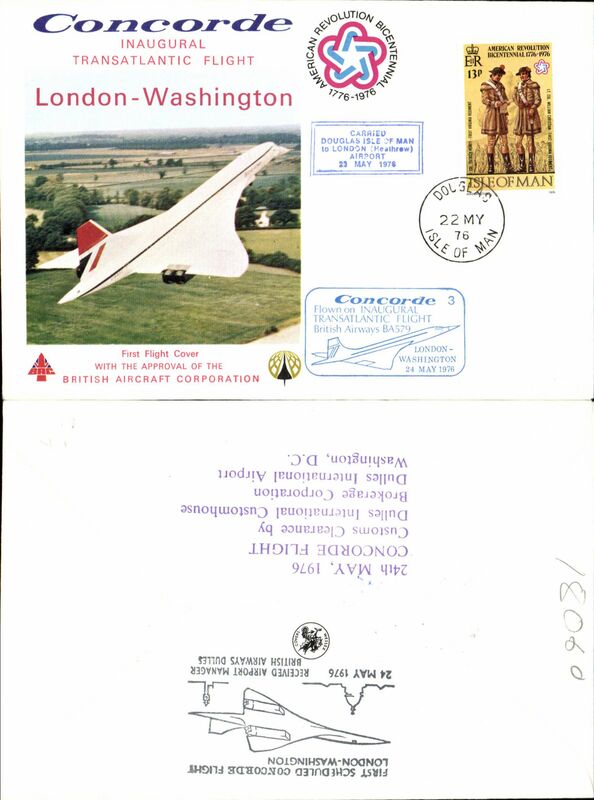 F/F inaugural Concorde transatlantic flight Washington-London, bs 25/5, illustrated souvenir cover franked USA 13c air, canc Washington DC cds, red framed 'Washington-London' flight cachet. 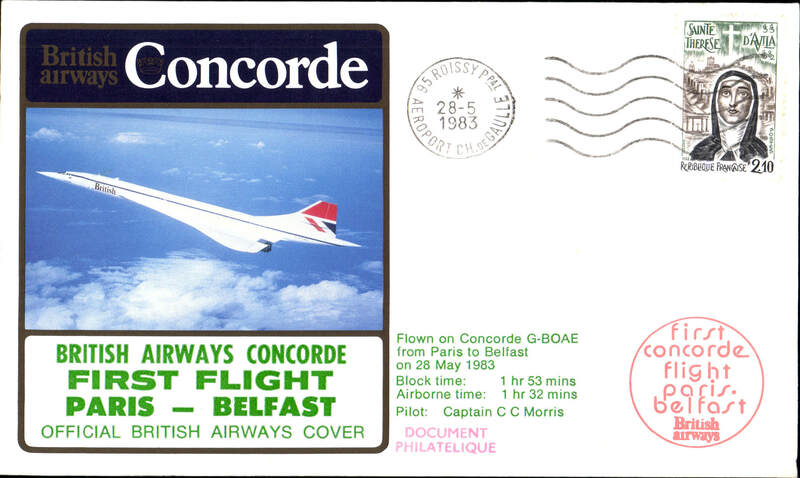 F/F Concorde, Paris to Geneva, bs 31/8, souvenir cover, postmarked 'Paris Concorde/31-8-76/Correspondance Privee'. 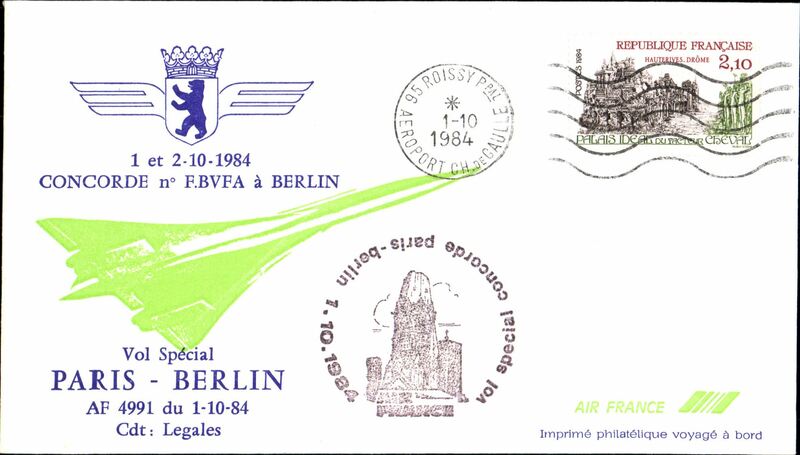 F/F Concorde, Geneva to Casablanca, bs 31/8, illustrated souvenir cover franked Switzerland 90c, Geneva Airport postmark, circular green flight cachet. 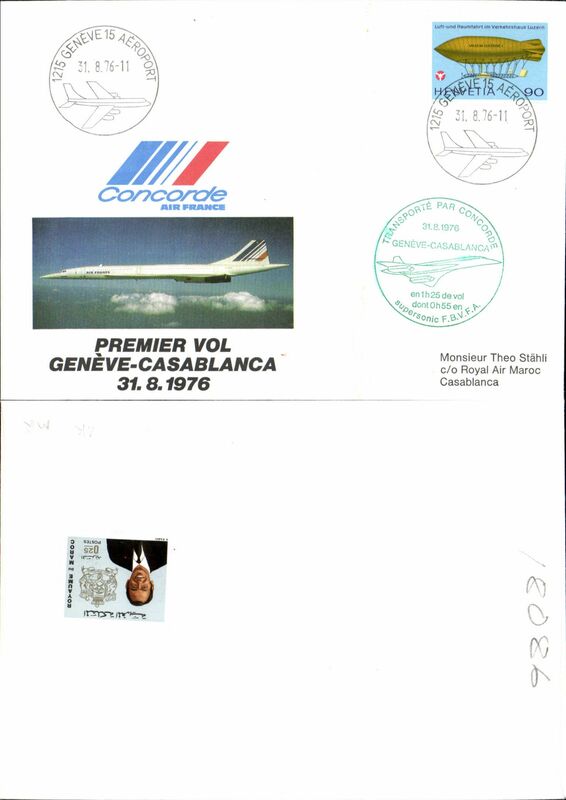 F/F Concorde, United Nations Geneva to Casablanca, bs 31/8, illustrated souvenir cover franked Switzerland 90c, Geneva Airport postmark, circular red flight cachet. 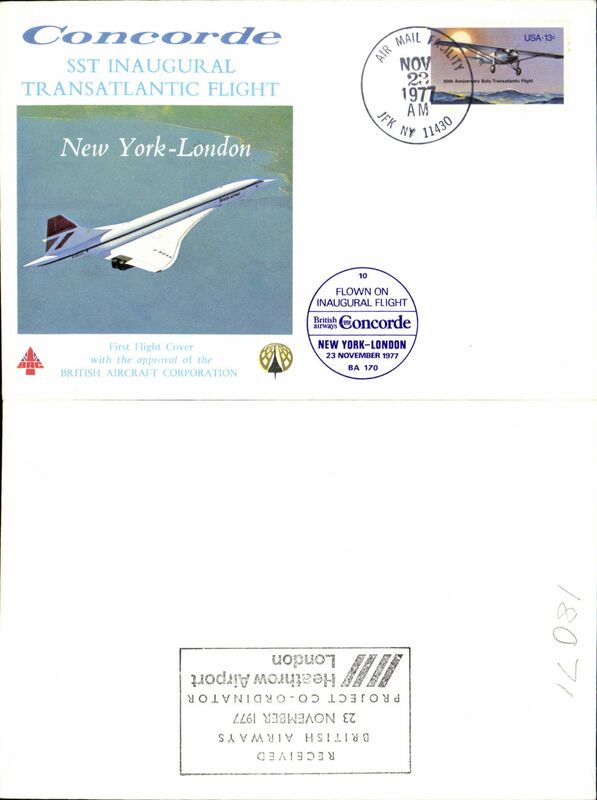 F/F Concorde, United Nations New York to London, special 'Heathrow/23 Nov 1977' arrival cachet on front, illustrated souvenir cover franked UN 31c, United Nations/New York/Nov 23 1977 postmark. 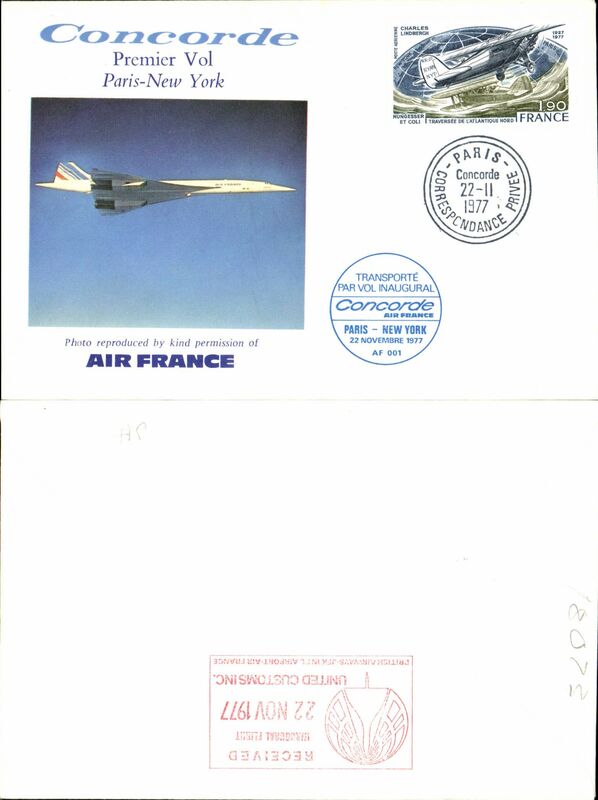 France souvenir FDC franked 1976 Concorde's First Commercial Flight, 1.70F. 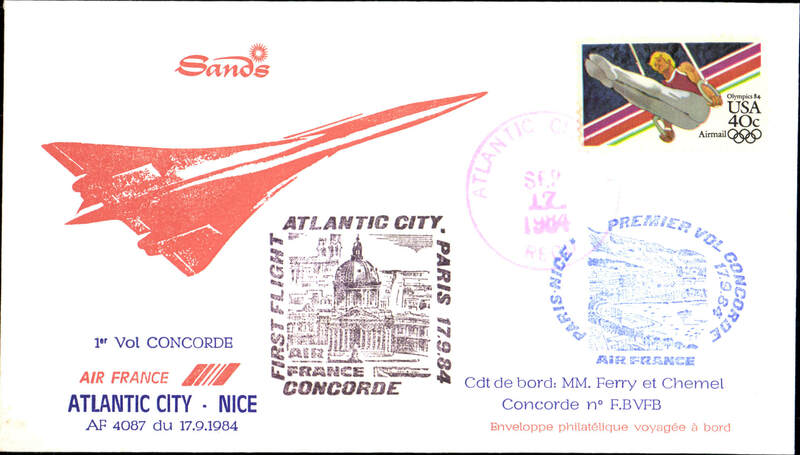 France souvenir maxi card franked FDI 1976 Concorde's First Commercial Flight, 1.70F. 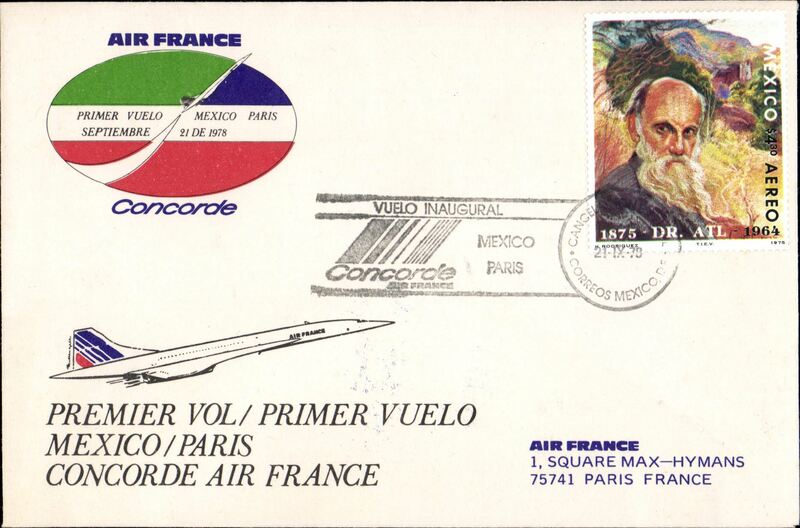 Air France Concorde, first Super Sonic Flight in Asia, Manila-Paris, Oct 4 Charles de Gaule arrival hs, souvenir cover. 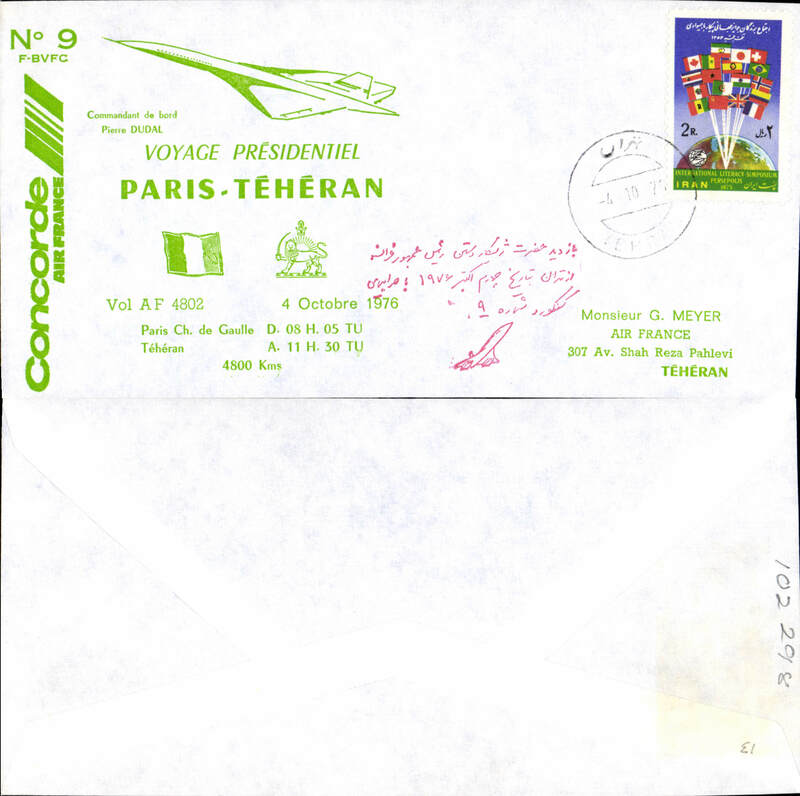 Air France Concorde, Paris - Tehran, POA franked 2R Iran stamp, canc Tehran cds, souvenir cover..
50th anniversary of transatlantic Aviation, multicoloured and gold commemorative mint label, 10x11cm, showing a British Airways Concorde on a GB QE 4d stamp, an Air France Concorde on a France 1.70F stamp, and the Spirit of St Louis on a US 13c stamp. 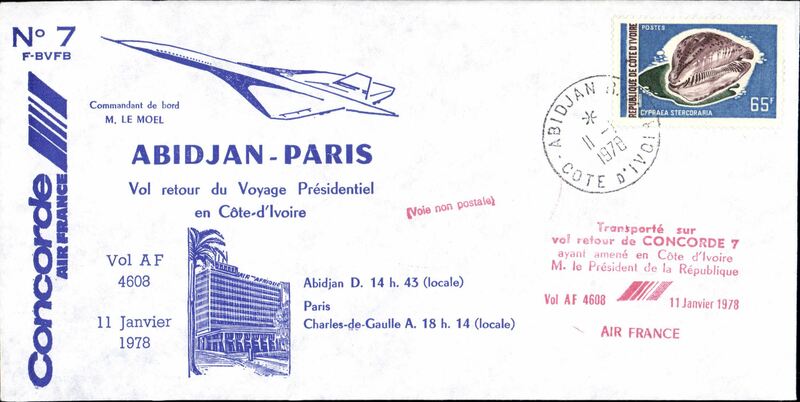 Wallis and Futuna souvenir FDC franked 1977 250F opt 'Paris-New York/22.11.77/1er Vol Commercial', cat SG£18.00 used. 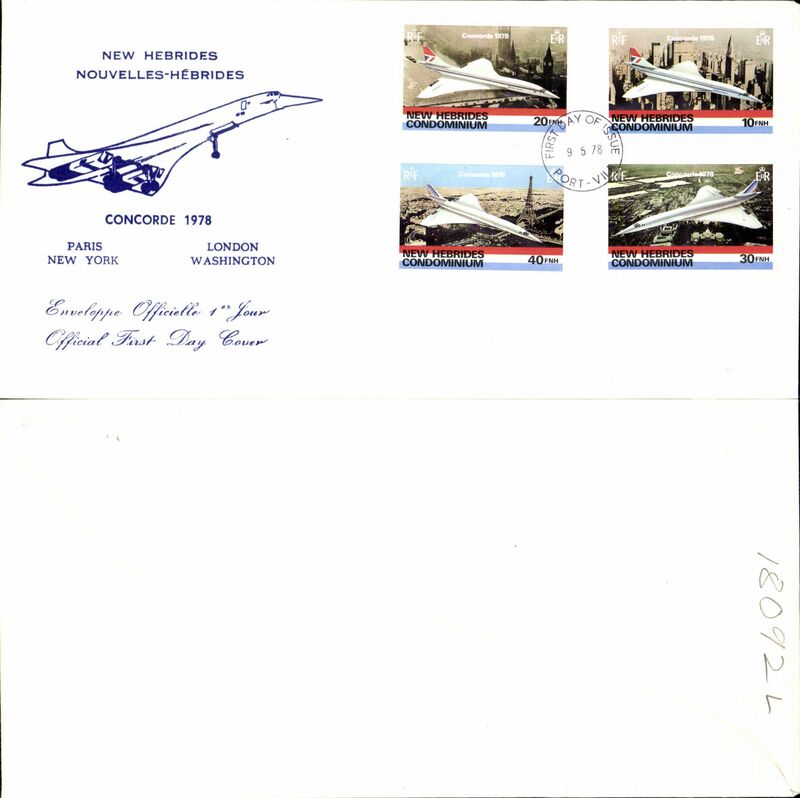 F/F Concorde, Paris to New York, bs22/11, souvenir cover franked France 1.90F Lindbergh air, postmarked 'Paris Concorde/22-11-77/Correspondance Privee'. 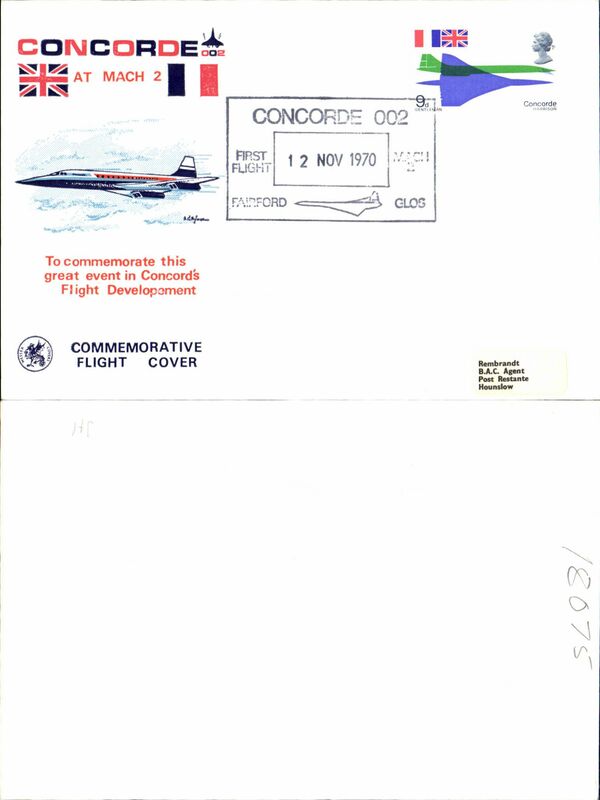 F/F Concorde, New York-London, bs 23/11, illustrated souvenir cover franked USA 13c air, postmarked 'AMF/Nov 23 1977/JFK NY' cds, circular blue 'New York-London' flight cachet. 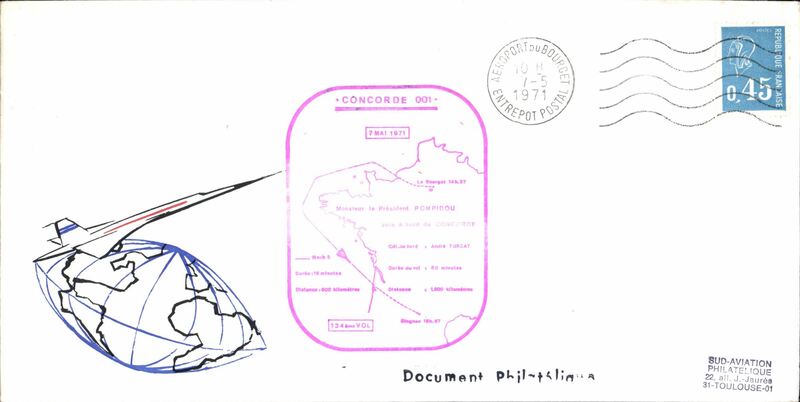 F/F Concorde, London to Singapore, bs9/12, illustrated souvenir cover franked GB 11p, special 'London Heathrow Airport/9 Dec 1977/Londn-Singapore' Concorde postmark. 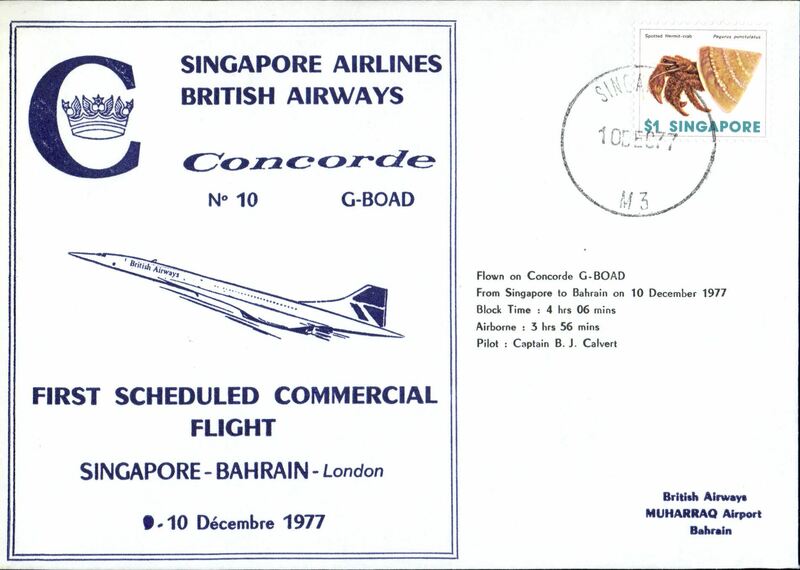 Concorde, 1st scheduled commercial flight Singapore to Bahrain, bs. 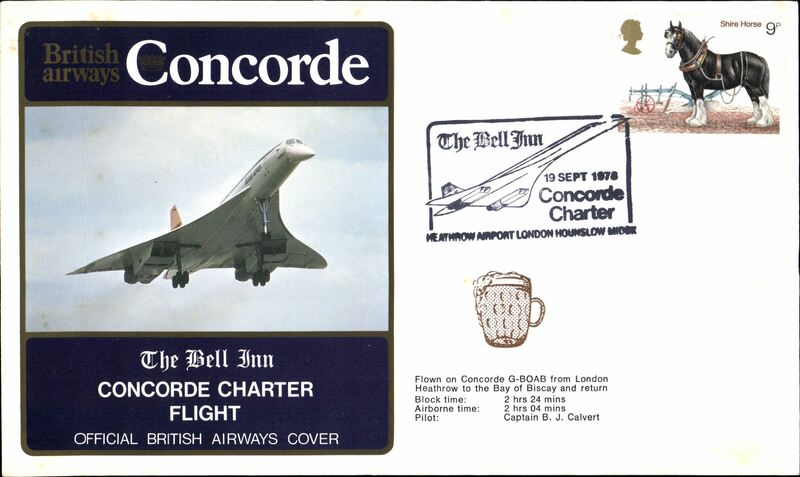 Concorde, The Bell Inn Charter Flight, bs. Concorde, Ivory Coast presidential flight, Abidjan to Paris, bs. 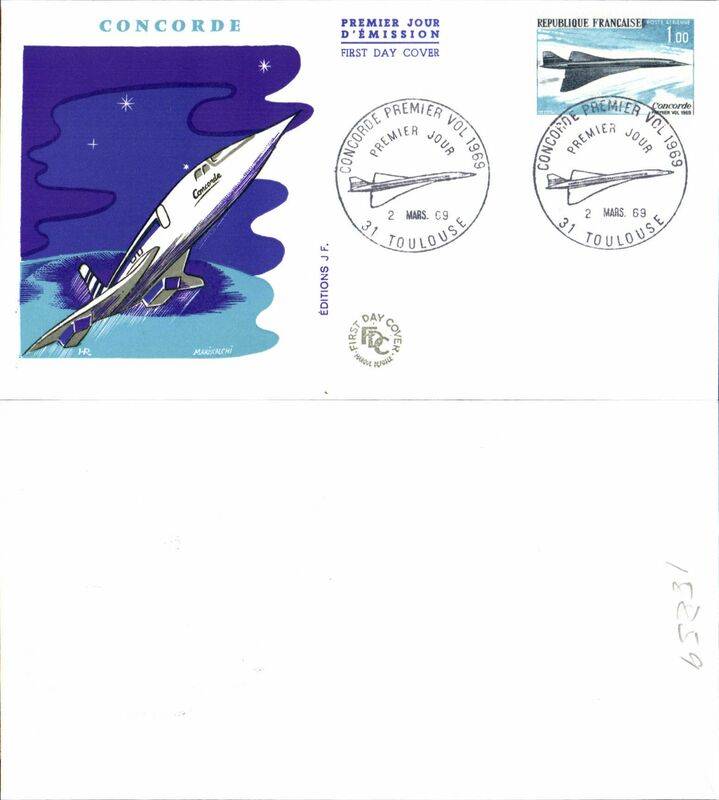 Concorde FDC franked 1968 FDI French New Caledonia set of 4, blue/cream souvenir cover. 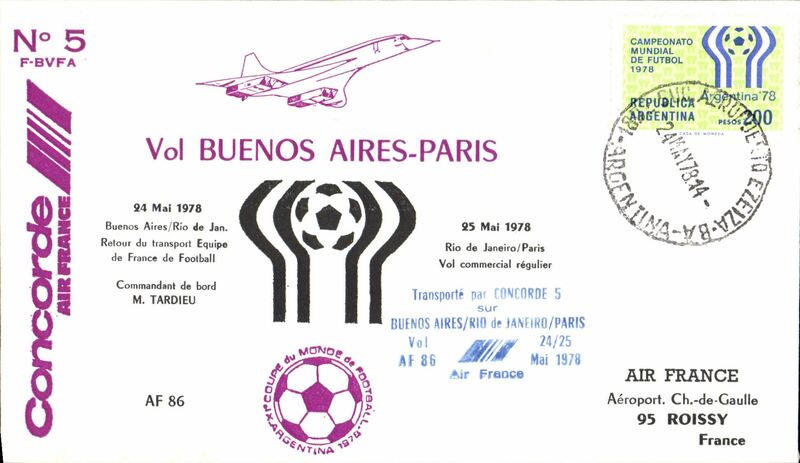 Air France Concorde, special flight carrying the French football team to the World Cup, Paris-Buenos Aires , 24 May 78 arrival ds. 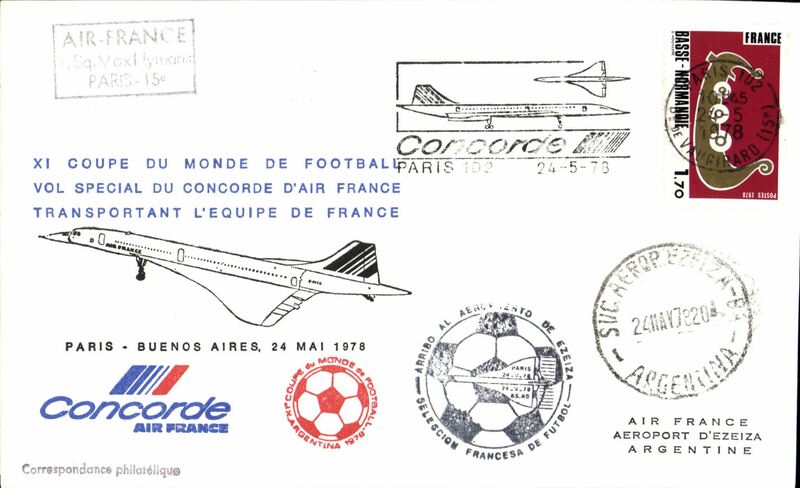 Air France Concorde, return of special flight carrying the French football team to the World Cup, Buenos Aires-Paris , 24May 78 Charles de Gaule airort receiver. 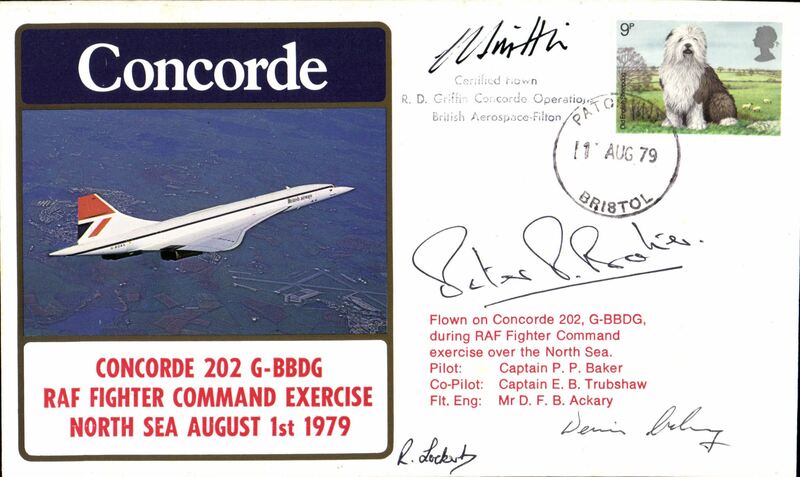 Concorde 202, RAF Fighter Command North Sea Exercise, franked GB 9d canc Patchway cds, signed. Italy, F/F Paris to Rome, souvenir cover. franked L150 canc Rome Airport. 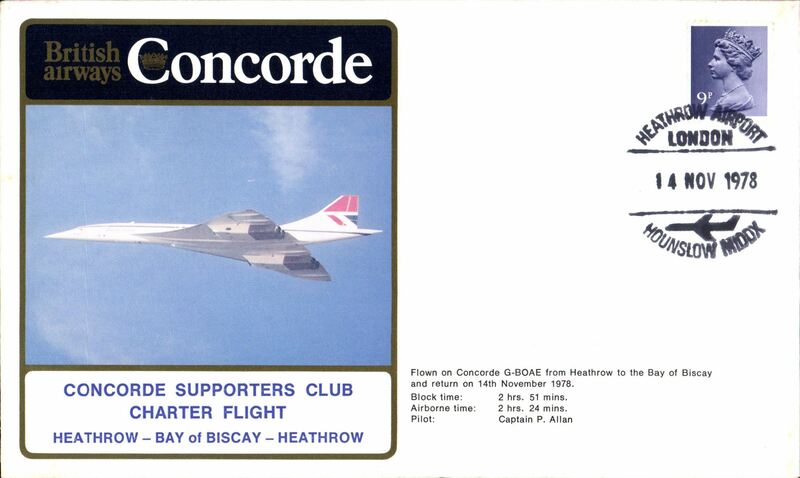 British Airways Concorde Supporters Club Charter Flight, Heathrow-Bay of Biscay-Heathrow, souvenir cover. Concorde, 1st flight Mexico-Paris, bs. F/F's London-Dallas (Fort Worth) and Dallas-London, two official Braniff International covers, bs's. Also certicates of authenticity. Concorde special flight from London to New York, bs29/7, commemorating the marriage of The Prince of Wales and Lady Diana Spencer, illustrated souvenir cover franked GB 25p, special 'Royal Wedding/29 July 1981' postmark, violet floral flight cachet. 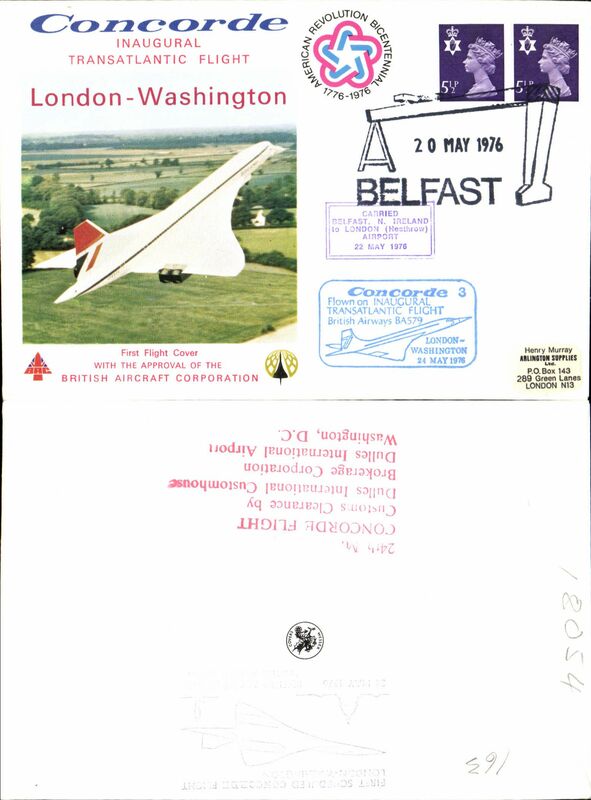 Concorde special charter flight from Glasgow to Paisley, 'Greetings from Glasgow Airport souvenir PPC franked GB 14p commemorating the marriage of The Prince of Wales and Lady Diana Spencer, canc special charter flight from Glasgow to Paisley/11Oct 1981 postmark. 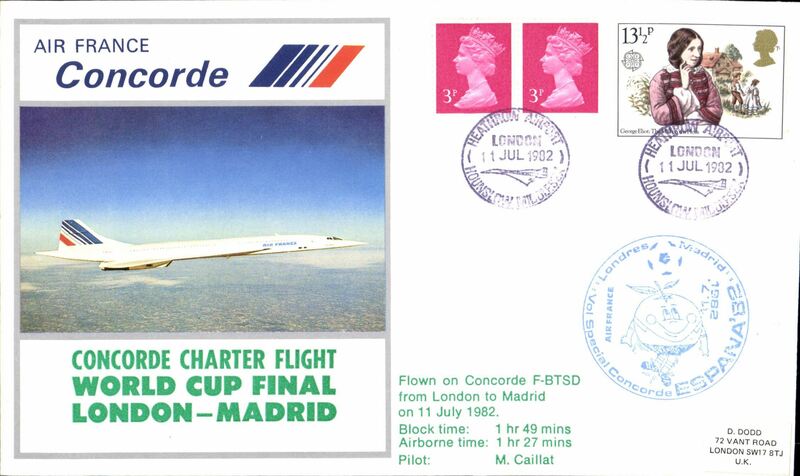 Air France Concorde Charter World Cup Final, Madrid-London, souvenir cover. 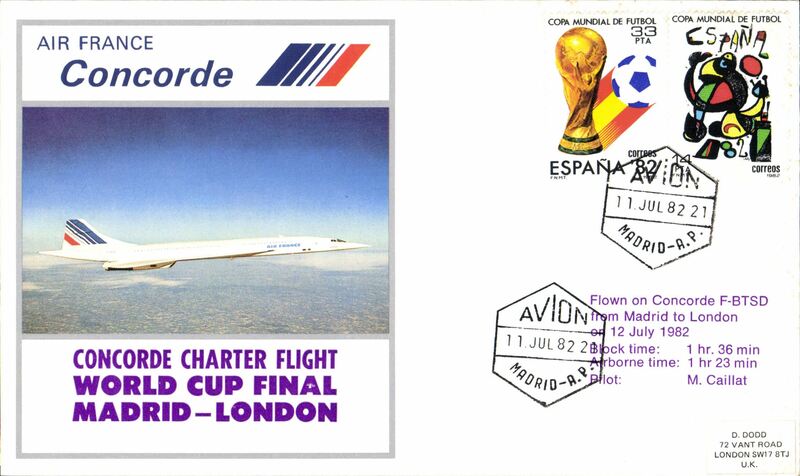 Air France Concorde, special World Cup Final charter flight, London-Madrid, bs Madrid 11/7. 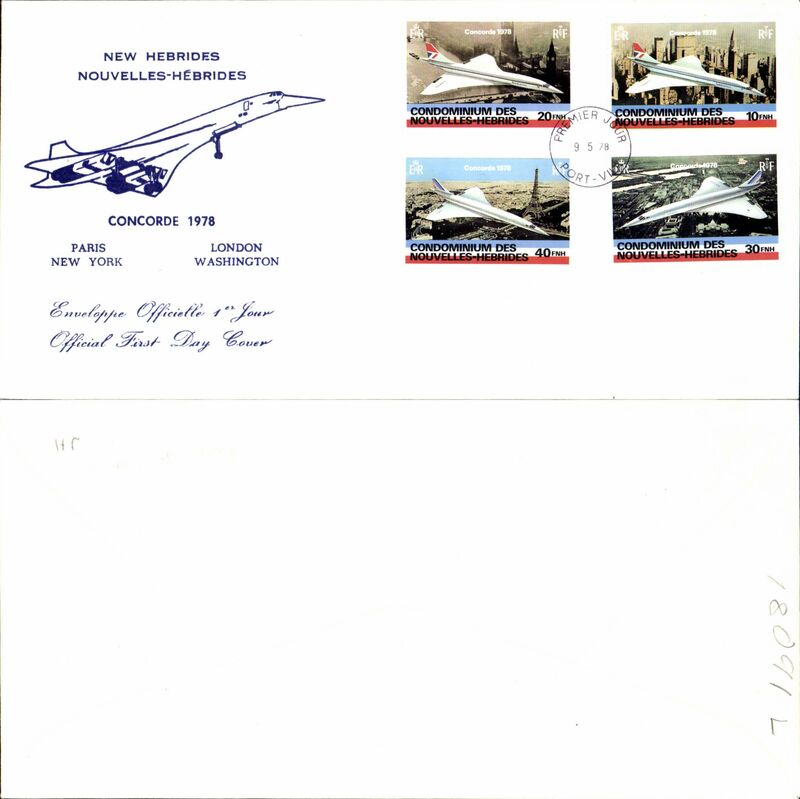 F/F Concorde, United Nations Geneva to New York, bs 2/8, illustrated souvenir cover franked UN) 35th anniversary miniature sheet, canc Geneve/2/8/82/Nations Unis' cds, green flight cachet. 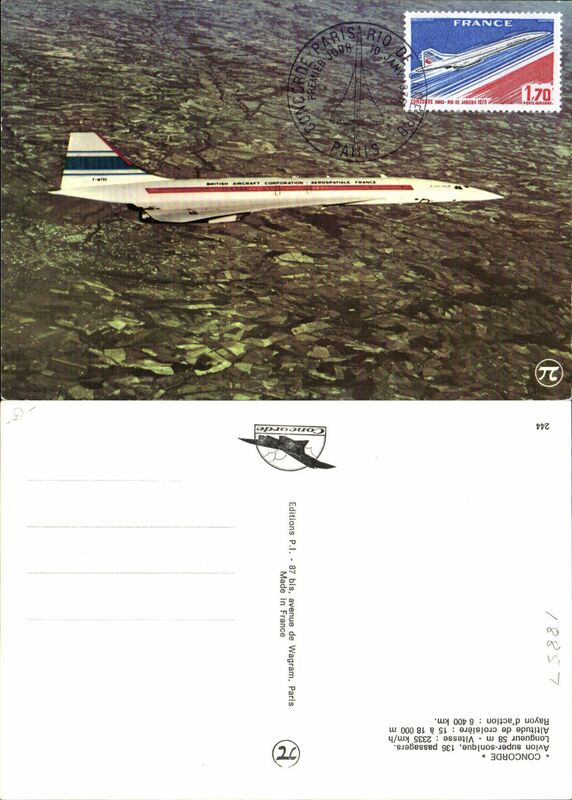 F/F Concorde, Geneva to New York, bs2/8, illustrated 'Avion Supersonique Concorde' souvenir card franked Switzerland 100c, Geneva Airport postmark, oval green flight cachet. 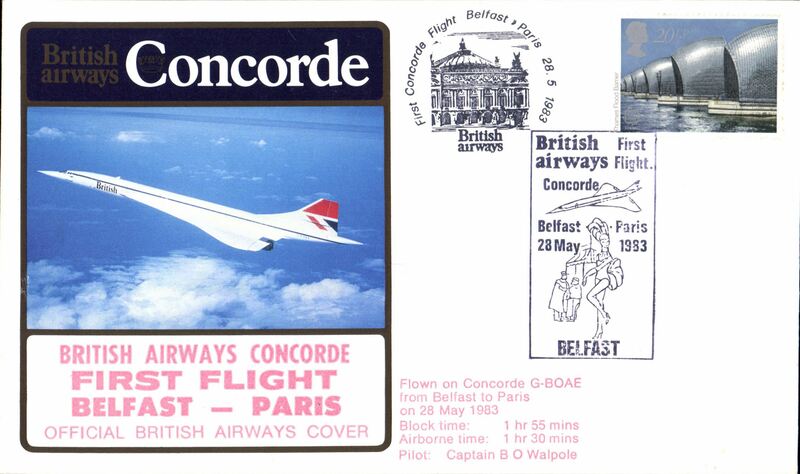 British Airways Concorde, F/F Belfast- Paris, souvenir cover. Concorde, 1st flight Paris-Belfast, bs. 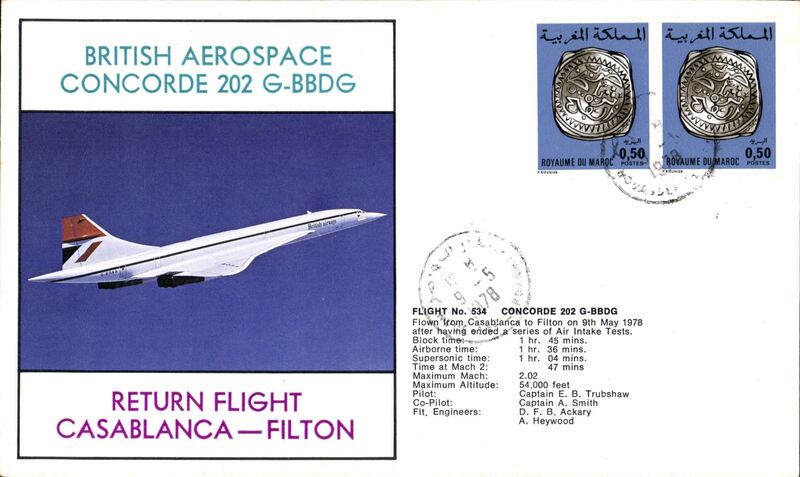 British Aerospace Concorde 202, return flight Casablanca - Filton, souvenir cover. 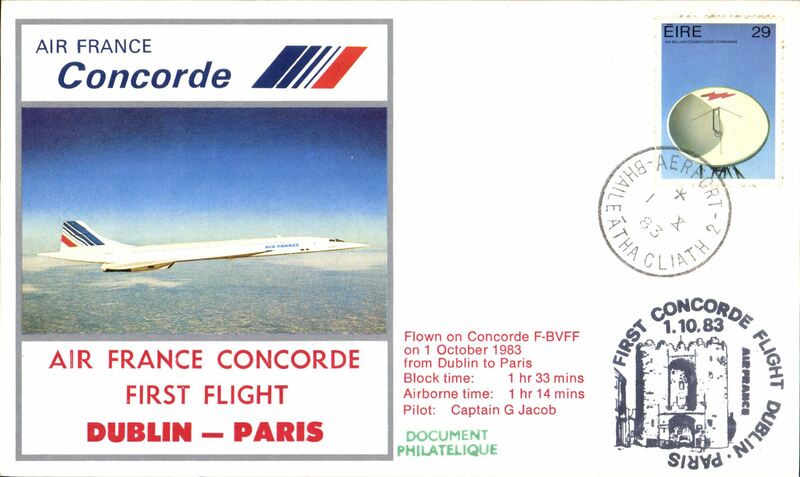 Air France Concorde, F/F Dublin - Paris, souvenir cover. 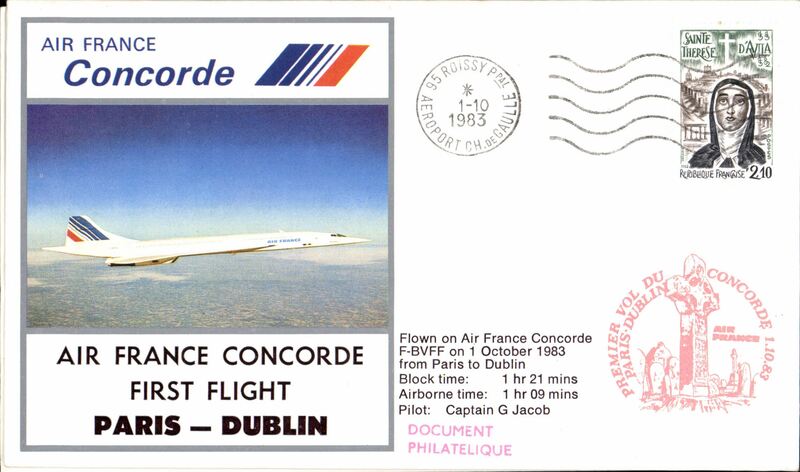 Air France Concorde, F/F Paris-Dublin, souvenir cover. 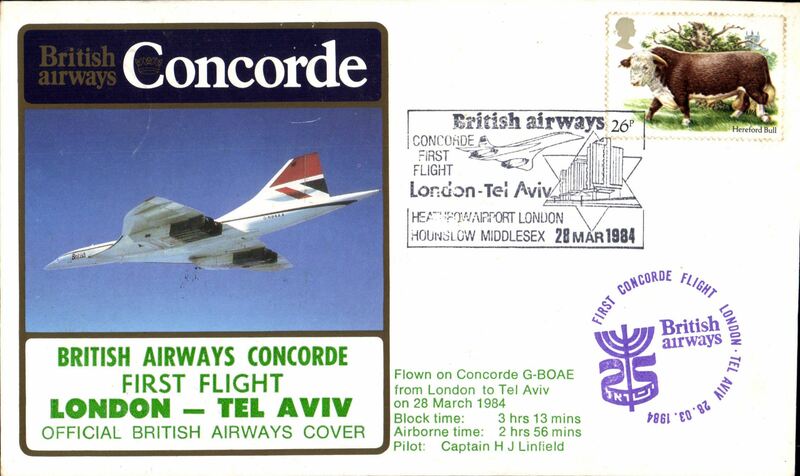 British Airways Concorde, F/F London-Tel Aviv, souvenir cover. Concorde, 1st flight Atlantic City to Nice, bs. Concorde, special flight Paris-Berlin, bs. 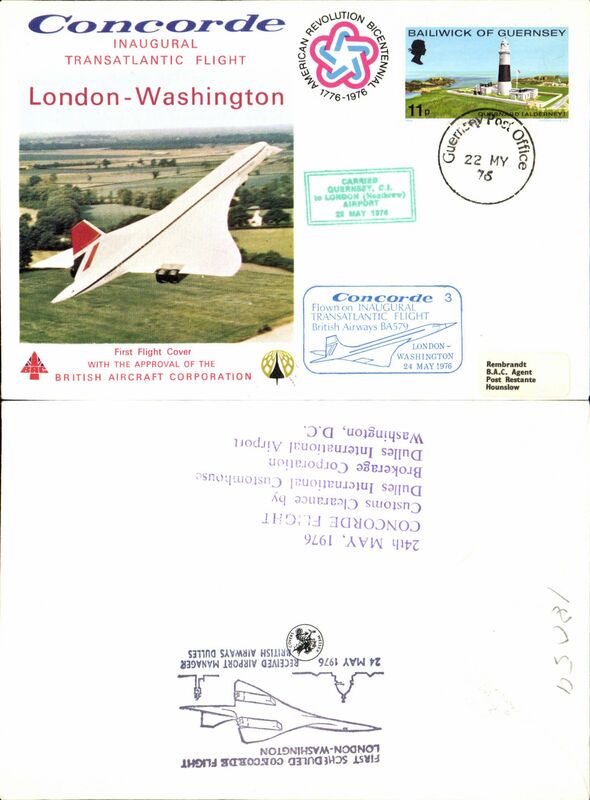 Concorde 25th anniversary, RAF Fairford Tattoo, air cover franked 25p, canc special dated souvenir postmark.